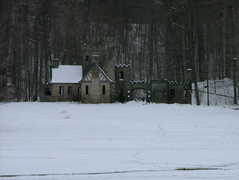 Squire's Castle, located in Willoughby Hills in the Cleveland Metroparks, was built in the 1890s by Feargus B. Squire, an executive with the Standard Oil Company. The British-born Squire intended to create a country estate, modeled after those in Britain. He began by building the gatehouse, complete with a living room, several bedrooms, and a hunt room with mounted animal heads. The Squires used the gatehouse as a weekend retreat while plans were being finalized for the main house. Mrs. Squire never liked the country. A city girl, she was scared of the quiet country nights and the sounds of animals. Urban legend says that she had so many nightmares that she was afraid to go to sleep and consequently went insane. According to the legend, she died one night when she became so frightened that she fell and broke her neck attempting to flee. The truth lies somewhere else. Mrs. Squire, although afraid of the country, did not die at the gatehouse, although she did die young, in 1929. Feargus Squire never completed the estate after his wife's death, and the gatehouse was abandoned. Today, the structure is but a stone shell, owned by the Cleveland Metroparks. Periodic functions are held at the "castle." Park visitors can walk around the structure and imagine it adorned with Tiffany glass, carved mouldings, and elaborate European furnishings.